Casino Slot Machines vs. Online Slots | What’s Better? Did you know over a quarter of Americans visit a casino at least once a year? According to the American Gaming Association, that number will only grow as more tribal casinos open across the US and legalized gambling expands beyond Las Vegas. It’s easy to see why. Unlike most other entertainment and nightlife options, casinos offer that glimmer of hope of winning big. And even if the night ends without a jackpot, the thrill of possibility adds a measure of excitement you just won’t find elsewhere. For those who have never been to a casino before, venturing out for the first time may seem a little bit intimidating. But don’t worry. There’s no fuss here at Golden Acorn Casino in San Diego. All we want to do is help you take your fun up a notch or two. Still concerned about the whole new-to-the-casino thing? Ok, we hear you. Take a look below at our top tips for casino beginners. They should put you at ease and get you ready to ramp up the fun-factor in your life. Gambling is by definition a risk, but there’s no sense in worsening your odds by not understanding the rules of the games you play. Slot machines and bingo are pretty self-explanatory, but if you have your eye on a table game like Blackjack or Poker, be sure to read up on rules and strategies before you go, or try out some free online games for practice. And if you blank on the rules once you’re already at the table, don’t worry—dealers will typically help out and offer generalized advice, so don’t be afraid to ask. Somewhere between Yuma and San Diego, you notice signs along the side of the road and you pick up an itch on one hand. You’re feeling oddly lucky. As you roll down I-8, you see the off-ramp and swing over to the exit. This is the place! This is where you’ve come to test your luck. 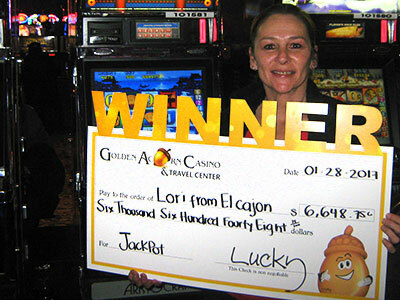 Welcome to Golden Acorn Casino & Travel Center! If your concept of slot machines is the stereotypical “one-armed bandits,” have we got some games to introduce for you! Today’s slots are engaging and entertaining multimedia experiences. Instead of looking at the same three or five wheels with bits of fruit on them, your eyes and ears are treated to stirring themes and elaborate animations. Watch a serpentine dragon bring you good luck in Dragon’s Law. Or get into a mariachi mood with Fiesta Sun. With so many slots, there’s something for everybody to play, and you might just hit a major jackpot in the process!